A smart home is a term which is used for a home that uses web-associated gadgets to run through remote sensing devices. Home automation or smart home technology gives safety, support, and reliability to owners of the house by letting them run their home appliances. They can do all this by tapping on a smart home application installed on your smartphone or any other similar device. This technology is a part of the Internet of Things. This technology functions as per the preferences of the housemates. 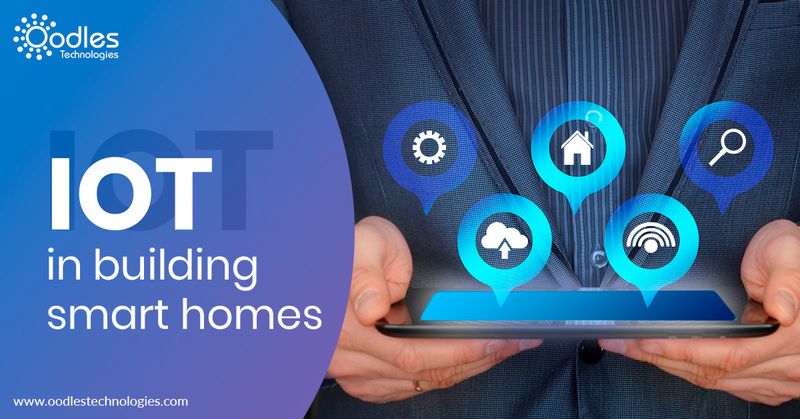 In this blog, you will get to know how IoT services are transforming homes into smart homes. Many companies were working on the smart home concept for many years. Initially, radio frequency signals were used to dispatch commands to the respective devices, managing when and how to run devices. Today, many companies like Google, Apple, and Amazon are working on building smart home products. Apple HomeKit, Google Home are some of the few examples of such products. With the presence of technology, human lives have become easier, and simpler. In every phase of life, we have seen the invention of a new smart home product on regular basis. Let’s see the products which are transformed by smart home technology. Smart Phones: Today, we can’t even think our lives without our smartphones, we are able to do most of our day to day tasks through our phones which were once restricted to a few devices. Smart Lightings: Smart lightings are able to detect whether someone is in the room or not, and as per the requirement, the lighting gets adjusted. Smart Televisions: Smart Televisions let users access the internet on it. Even most of the TVs also have gesture or voice recognition functions. Smart Cameras: Through Smart cameras, users can easily have an eye on their homes, whenever they are far away from their premises. These smart cams will let you see live and recorded video streaming of your homes, whenever you wish to. Smart Appliances: Smart appliances will automatically turn off if you forgot to turn them off after use. Smart washing machines, irons, refrigerators and many more. Smart ACs: Residents don’t have to ruin your sleep to turn off or adjust the temperatures of your air conditioners anymore. Smart AC will automatically sense and adjusts the cooling of your room as per the temperature. Smart Locks: Smart locks will automatically open doors for housemates and for the people who are allowed by the family. Even we can authorize and deny the entrance of visitors as per our wish. Smart locks can play the alarm if someone tries to open it without the permission of the owner. Smart Pet Cares: The owner of the pet doesn’t have to worry about whether their pet is fed or not. With the help of smart pet care device, the food can automatically come out and your pet can have it. You can even detect on your smartphone whether your pet had his food or not and how much quantity is left in the linked pet food feeder. One of the major advantages of this technology is that it will give peace to house owners. Now, they don’t have to worry about their home if they are not present, they don’t have to worry about their pets, plants, and many more. Even kids and older people are safe, you don’t have to worry that they might forget to turn off any appliance. Also, it gives them a sigh of relief because the family feels safe while having Smart devices around them. Smart home technology has been a gamechanger for many industries in the last few years. You can confidently invest in this technology as this is in demand today. People are curious to have smart devices in their homes. They have a huge role in improving their living standards. Oodles Technologies is also one of the best app development company in India. You can contact us 24*7 for creating IoT based mobile applications.